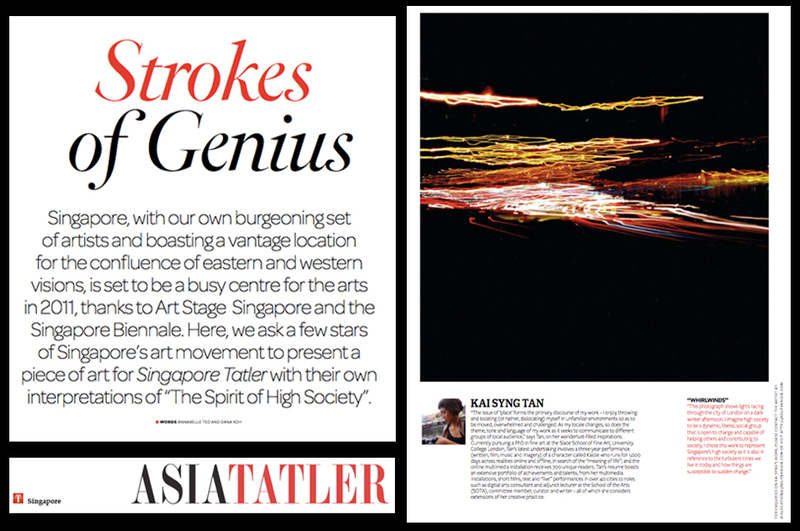 IN 2011 JANUARY 11, WE (Kaidie, Kai die, Kai live, Kai Syng Tan, dead Kai) POPPED UP AT ASIA TATLER (Singapore). As you well know, we are highflying, highlycultured, highlycultivated, highbrowed and hightea-ed. At the same time, we are thick as a slice of 14-month-old Tesco’s nofrills white-sliced bread (made of highly-refined plain flour!! ), and our humour, as you our dear Reader knows well by now, is lowbrow and scatological. Yeah baby. Nonetheless, at the very least we do have a sense of humour. We are uncertain if many other people can say the same. Our life as it is has been fluctuating high-and-low as usual, but a few weeks ago it was temporarily associated with the high society, as we (all of us – Kai, Kaidie, Kai Syng, Kai Die, Kai Live, Kai Lives) were featured in the Tatler Asia (Singapore) magazine. Not our usual strasse shall we say, as our usual strasse is concrete (specifically on the pavements of lovely large cities) as well as ones-and-zeroes (on the information superhighway). Here is the lowdown (how could we possibly resist such a cheap pun??). This entry was posted on Tuesday, February 1st, 2011 at 16:33	and is filed under PRESS COVERAGE and tagged with between life & death, existence, imagination, nondon, tourist, travel, travelling. You can follow any responses to this entry through the RSS 2.0 feed. You can leave a response, or trackback from your own site.